Call the nursery on 01942 512791 for further information. Our Leigh nursery provides a home from home that children love and parents trust. Our aim is to make your child as happy as possible and our whole approach to childcare and everything we do involves making your child happy as our top priority. The early years of a child's life are the most important in their development and what they learn now stays with them for life. We believe in getting children into good habits early and that the happy habit is the most important of all. Being happy involves lots of different things but central to it is loving ourselves and being able to cope with life's setbacks when they come along. So our childcare places a great emphasis on creating strong, confident and resilient children through our wellbeing program. But it doesn't end there - we build on children's natural sense of wonder, creativity, and curiosity to create happy days that are positive and full of excitement. 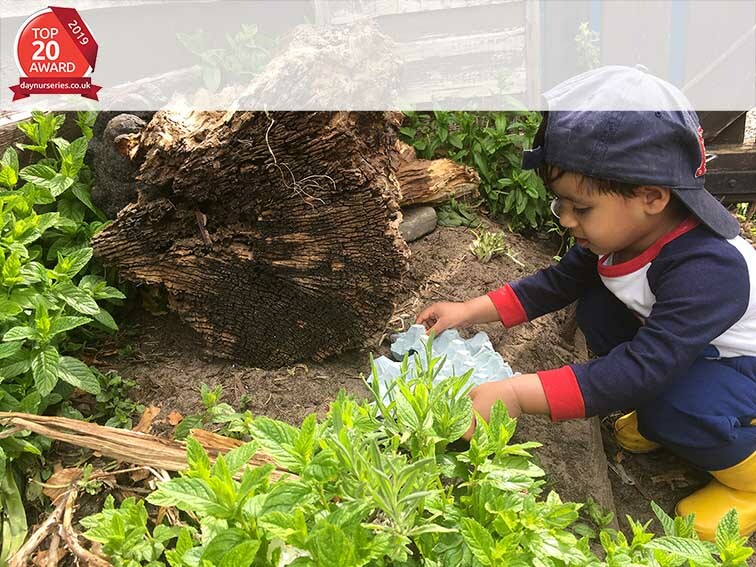 Our nursery empowers children's imagination through fresh air, freeplay and fun, all the while encouraging them to be happy as they learn and grow. At Bluestone Nursery we have drawn on the latest techniques and ideas from around the world in our approach to caring for your child. So much so that we are the cornerstone of a 5 year research program into "Smiles and Laughter in the Early Years". Natural resources, good food, tons of fun and lots of love mean that you can rest assured that your child will get off to a great start in life with Bluestone Nursery. "There is a strong emphasis on children's personal, social and emotional development. Staff take time to develop secure relationships with the children, so they are happy and settled." "Children are motivated and eager to learn. They can freely access the range of activities, which are attractively presented to catch their attention." "All children make good progress across all areas of learning." "This is an excellent nursery and my little girl absolutely loves it." "I would definitely recommend this nursery as I have had different experiences with other nurseries and this one comes out top for everything." "Cannot think of a better place for the care of my son, nothing is too much to ask and found the staff to be really helpful and cooperative. "Thank you for making my nursery days so much fun"
"The staff are very happy and friendly"
"Thank you for taking such good care of our little girl. Daisy has loved it here and thinks the world of you all." when we know they are so well looked after and have so much fun"
"Elliot absolutely loves coming to nursery"
thank you so much for taking such good care of our boys"
"We are really happy with Sophia's development. She seems to be progressing so quickly and is so happy and content"
"Thank you for helping me grow. I hope school is as much fun as preschool."